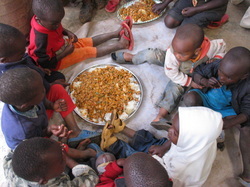 Under this program, the Centre provides hot food to about 60 orphaned and vulnerable children. The program also provide lunch for those that cannot get food at home as well as paying for some medical bills, clothing and house rent for the very poor. The program also provides them with other support services such as limited scholarships, career guidance, medical care and sporting facilities. Also children receive other forms of support including books, school uniforms and other educational materials. All these children range from nursery school (early childhood school) to secondary school level. The ones in nursery school and lower primary school also receive remedial tuition three times in a week in various subjects such as Mathematics, Kiswahili and English They are also provided with the project hall to do their studies in the evenings and over the weekends.